Finally we arrive into this spring season of hope, renewal, and anticipation. 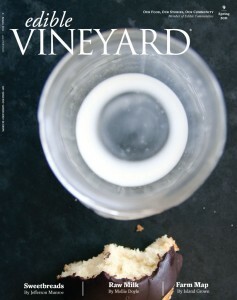 In this issue of eV we offer you earthly delights—rich, diverse and unexpected. Raw milk, shad roe, cheeses, sweetbreads, licoricey-fennel, and a feature about the grasses that feed the animals who feed us—Hay by Remy Tumin. Two new departments by local farmer-writers debut in this issue: “Land” by Emily Palmer takes a closer look at the issues that lie under our feet—from access to fertility to the future of the Island’s open working spaces. Jefferson Munroe’s “Variety Meats” gently acquaints eV readers with some nose-to-tail menu options for the omnivore. As for food for thought, Alicia Harvie’s piece explains the complications and implications of genetically engineered (GE) crops. Dr. Constance Breese’s “Vet Call” about udderhealth was quite an assignment for MVRHS senior, photographer Tova Katzman. Kate Tvelia Athearn writes poignantly about the intersection of livestock meeting the neighbor’s pet dog. We welcome photographer Sybil Teles of Savannah, Georgia, and Oak Bluffs, for her aesthetic and sense of play. We also relish Betsy Carnie, our roaming thrift store stylist, and as always, seasonal recipes by Hara Dretaki—a little Greek, always Island. We say a fond and gracious farewell to eV’s founding art director, Island-grown Lauren Carelli. Lauren visioned eV into itself, and we are forever grateful. A revolutionary, she is moving always forward following her love, dreams, and a life of fine art. Nevertheless, it is with gusto that we proudly introduce our new art director, Carrie Gee. Carrie’s culinary and design experiences hail from national print media, photography, illustration, and a passion for cooking breakfast and starry nights. Thank you, dear readers and advertisers.,We hope you enjoy this issue. Embrace change, hold onto your ground, swim in the seas, and delight in the unexpected pleasures that surround you.